The Kansas State Wildcats take on the Arkansas Razorbacks on Saturday, January 2nd, 2016 in the Liberty Bowl. The opening line for this game has Arkansas as 13 point favorites and the over/under was set at 62.5. Kansas State was led in passing last game by Kody Cook, who finished with 121 yards through the air. He went 4 for 12 on the game, good for a 33% completion percentage. Charles Jones led the Wildcats in rushing with 44 yards. He averaged 3 yards per carry on his 14 rushing attempts for the game. Deante Burton was the team leader in receiving with a total of 135 yards and 5 receptions. He finished the game with an average of 27 yards per reception. As a team in that game Kansas State totaled 304 yards by way of 80 plays. They rushed the ball 49 times for a total of 98 yards on the game and the Wildcats totaled 15 first downs by getting 6 rushing, 7 passing and 2 by penalty. Arkansas was led in passing last game by Brandon Allen, who finished with 102 yards through the air. He went 11 for 17 on the game, good for a 65% completion percentage. Alex Collins led the Razorbacks in rushing with 130 yards. He averaged 4 yards per carry on his 30 rushing attempts for the game. Dominique Reed was the team leader in receiving with a total of 37 yards and 4 receptions. He finished the game with an average of 9 yards per reception. Arkansas totaled 310 yards by way of 69 plays. They rushed the ball 52 times for a total of 208 yards on the game and the Razorbacks totaled 19 first downs by getting 12 rushing, 6 passing and 1 by penalty. Kansas State is averaging 30.5 points per game on the offensive side of the ball. They are completing 12.5 passes per game on 26.7 attempts for a 46.9 percent completion percentage and average 177.1 yards in the passing department per game. The Wildcats are running for an average of 163.5 yards per game on 42.3 attempts for an average of 3.9 yards per carry. They run 69 plays per game and average 4.9 yards per play for an average of 340.6 total yards each outing. The Wildcats get 18.9 first downs per game and they average 39.7 penalty yards via 5.2 penalties each contest. Kansas State gives up an average of 283.1 passing yards and 30.3 points per game on the defensive side of the ball. They allow 22.5 completions per game on 35.4 attempts for a completion percentage of 63.5. The Wildcats allow an average of 159.4 rushing yards per game on 37.4 carries for a 4.3 average. Kansas State gives up 442.5 total yards per game including 6.1 yards per play. They force 1.2 turnovers per contest and get flagged for 6.2 penalties per game that total 56.3 yards as a unit. Arkansas is putting 35.2 points on the board per game on the offensive side of the ball. They complete 18.8 passes per game on 29 attempts for a 64.9 percent completion percentage and average 264.3 yards in the passing department for each outing. The Razorbacks run for an average of 193.7 yards per game on 39.1 attempts for an average of 5 yards per carry this season. They run 68.1 plays per game and average 6.7 yards per play for an average of 457.9 total yards per game. The Razorbacks are averaging 22.8 first downs per outing and accumulate 38.1 penalty yards via 4.4 penalties each game. 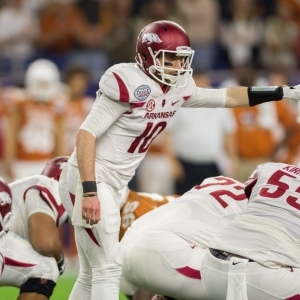 Arkansas gives up 284.5 passing yards per outing and 27.8 points per game on the defensive side of the ball. They allow an average of 22.3 completions on 34.3 attempts per game for a completion percentage of 65.2. The Razorbacks allow an average of 119.6 rushing yards per game on 31.8 carries for an average of 3.8 yards per carry. Arkansas gives up 404.1 total yards per game including an average of 6.1 per play. They create an average of 1.3 turnovers per game and 4.4 penalties for 34.7 yards each game.